Sol LeWitt, a pioneer of minimal and conceptual art, exhibited five structures in his first solo exhibition in 1965. With matter-of-fact titles like Floor Structure and Wall Structure, the rectangular black wood forms signaled his lifelong commitment to an elemental geometric vocabulary, as well as a sensitive consideration for the architectural context of his work. The wall is never merely a backdrop in LeWitt’s art; it assumes primary importance as a critical component in many of his three-dimensional structures and as the surface upon which his wall drawings are painted or drawn. Circle with Towers is, in effect, a low circular wall capped at regular intervals by eight rectangular towers made of pale gray concrete blocks. The outdoor structure possesses a discernable logic and rhythm: the concrete towers are four blocks wide while the low walls between them are eight blocks wide—a perfect 1:2 ratio. The concrete block structures are laid by hand, one block at a time by local masons. Like many of LeWitt’s works, Circle with Towers demonstrates the artist’s generosity in welcoming others to interpret his work, including the artists and craftspeople who realize his artistic visions. LeWitt introduced concrete block into his work in the 1980s. A humble material, it appealed to his interest in making art that privileged concepts over materials or surfaces. He also liked that the rectangular blocks could be stacked on end so that the cube, or square, becomes a repeating motif. While LeWitt’s work evolved in significant ways over the course of his career, the cube appears at each phase and in every medium, from sculpture to photography. The square and cube were both crucial elements in LeWitt’s vocabulary, both as elemental units and in reference to grids made by other artists throughout the twentieth century. The project was carried out by Rudd & Adams Masonry, Inc. under the supervision of Austin Commercial, contractors, and Jeremy Ziemann, Principal Oversight, Sol LeWitt Structures. Although LeWitt is best known for the more than 1,260 pencil, chalk, and painted wall drawings that he produced during his lifetime, his first solo exhibition—which was held at the Daniels Gallery in New York in 1965—consisted of five sculptures, or structures. With matter-of-fact titles like Floor Structure and Wall Structure, the rectangular black wood forms signaled his lifelong commitment to an elemental geometric vocabulary, as well as a sensitive consideration for the architectural context of his work. During the 1960s, LeWitt also helped formulate the tenets of a burgeoning conceptual art movement. In his 1967 essay for Artforum, “Paragraphs on Conceptual Art,” LeWitt argued that the concept behind a work of art was more important than its execution. “To work with a plan that is preset is one way of avoiding subjectivity,” he explained. His instructions-based conceptual practice also proposed a very different model of artistic authorship, one that defined artistic practice by an artist’s ideas, not by the personal touch or mark of the artist’s hand. LeWitt frequently likened his role as an artist to that of an architect or composer. He drafted compositions that others—fabricators for his three-dimensional work or students and artists for his wall drawings—could realize. Although LeWitt enjoyed working with preset concepts and systems, the remarkable variety of work he produced during his lifetime attests to the freedom he found within self-imposed limitations and the benefits he yielded from the collaborative nature of his practice. The wall is never merely a backdrop in LeWitt’s art. It assumes primary importance as a critical component in many of his three-dimensional structures and as the surface upon which his wall drawings are painted or drawn. It is not surprising, then, that LeWitt eventually set his sights on constructing walls as well. Circle with Towers is, in effect, a low circular wall capped at regular intervals by eight rectangular towers made of pale gray concrete blocks stacked atop each other like a Rubik’s cube. The outdoor structure possesses a discernible logic and rhythm: the concrete towers are four blocks wide while the low walls between them are eight blocks wide—a perfect 1:2 ratio. The fact that there are eight towers, each composed of repeating four-sided square modules, further instills a sense of calibrated order. LeWitt first conceived Circle with Towers for an exhibition at New York City’s Madison Square Park in the summer of 2005. For the initial installation, the sculpture was paired with one other structure—a serpentine wall, also made out of concrete blocks. The curved contours of both works sympathetically registered the oval shape of the park’s grassy lawns, while the stacked concrete blocks harmonized with the urban context of Manhattan’s gridded sidewalks and skyscraper windows. LeWitt introduced concrete block into his work in the 1980s. A humble material commonly found in school gymnasiums and college dorm rooms, concrete block appealed to his interest in making art that privileged concepts over materials or surfaces. He also liked the fact that rectangular blocks can be stacked on end so that the cube, or square, becomes a repeating motif. While LeWitt’s work evolved in significant ways over the course of his career, the cube appears at each phase and in every medium, from sculpture to photography. It is telling that LeWitt’s first published essay was entitled “The Cube”—a short tract dedicated to the module that first appeared in the 1966 summer issue of Art in America. In the essay, he maintains that, “The most interesting characteristic of the cube is that it is relatively uninteresting. . . . Compared to any other three-dimensional form, the cube lacks any aggressive force, implies no motion, and is least emotive. Therefore it is the best form to use as a basic unit for any more elaborate function, the grammatical device from which the work may proceed.” The square and cube were both crucial elements in LeWitt’s vocabulary, both as single units and as the basis for the ubiquitous grids found not only in his art, but also much of the art from the postwar period. Given the dialogue that exists between LeWitt’s structures and architecture, it is fitting that Circle with Towers has been erected in front of the new Gates Computer Science complex designed by New Haven–based architecture firm Pelli Clark Pelli. As LeWitt explained in a 2003 interview, “I have always called my three-dimensional work ‘structures’, because my thinking derives from the history of architecture rather than that of sculpture.” LeWitt also repeatedly invoked architectural practice when explaining his conceptual, hands-off approach to making art: “Working in an architectural office, meeting architects, knowing architects had a big effect. An architect doesn’t go off with his shovel and dig his foundation and lay every brick. He’s still an artist.” The fact that LeWitt’s structure will greet students, faculty, and visitors to the Gates Center also seems appropriate, as both his instructional-based practice and computer code can be understood as generative languages. In keeping with LeWitt’s longstanding practice of employing trained labor, Circle with Towers was assembled at The University of Texas at Austin campus by local Austin masons, according to the late artist’s detailed instructions and with the guidance of Jeremy Ziemann, an artist who supervised the construction of countless LeWitt concrete block structures during the artist’s lifetime. In a career spanning nearly five decades, LeWitt employed legions of art students, fabricators, maquette makers, masons, master printers, and countless others to help execute the nearly 1,300 wall drawings, approximately 2,200 prints, and innumerable three-dimensional works he conceived. LeWitt was, effectively, a one-man WPA program of the postwar period. Unlike other visual artists who work with assistants, LeWitt always acknowledged the role of his collaborators—insisting that their names appear on museum and gallery labels and in any written materials accompanying his projects. LeWitt deliberately embraced a depersonalized approach to making art, epitomized by his famous 1967 declaration, “the idea is the machine that makes the work of art.” Nevertheless, his work retains a sense of the human body and hand, and of the manual labor that makes it possible. Even in his large wall drawings covered with arcs and lines, LeWitt prescribed that the grid be sized so that each arc could be drawn with the single sweep of a hand. Similarly, the concrete block structures are laid by hand, one block at a time. Like many of LeWitt’s works, Circle with Towers offers a glimpse into the artist’s generous mind and into the labor of the many people who are crucial to realizing his artistic visions. Although Sol LeWitt is best known for the many wall drawings he made during his lifetime, when asked once about inventing the medium, the artist drolly replied: “I think the cavemen came first.” LeWitt’s wall drawings are, nevertheless, radical in nature. They do not exist as permanent objects but rather as a diagram and set of instructions that are realized by a team of both trained and novice drafters for collectors and institutions. Moreover, while a single wall drawing can be owned by only one person, it may be on view simultaneously in an infinite number of temporary exhibitions. LeWitt often commented on the pleasure he took in the fact that his wall drawings could exist in more than one place at once, likening this to the way a Bach sonata can be played simultaneously in concert houses around the world. Wall Drawing #520 was first installed in 1987 at the Whitney Museum of American Art in New York. This current installation at The University of Texas at Austin marks the first time the work has been rendered since that initial presentation. During the 1980s, LeWitt chiefly produced jewel-toned ink-wash wall drawings like this one, dramatically expanding his repertoire from the pencil wall drawings that predominated the first decade of his career. In this wall drawing—one of the few that the artist ever conceived for three walls—cubes float across the walls without a clear logic to their placement. The colorful palette and slight depth of the geometric figures—which are characteristic of LeWitt’s wall drawings from the 1980s—attest to the artist’s interest in Italian Renaissance frescoes, an interest that was spurred by the artist’s move to Spoleto, Italy, in 1980. While these works depart from the more muted palette and systematic logic of LeWitt’s early pencil wall drawings, they also reflect his continued interest in using basic geometric elements like the cube (especially fitting here given the cubic concrete block structure in the Landmarks collection). Equally significant, the tonal variations achieved in LeWitt’s ink wash wall drawings result from layering only basic primary colors and gray. The diagram accompanying this work spells out the particular combinations and order of color for each facet of the figures: “RYBB” (Red, Yellow, Blue, Blue), “RRY” (Red, Red, Yellow), etc. While the spirit of Wall Drawing # 520 is one of modesty, simplicity, and restraint, the visual results are lush. In keeping with LeWitt’s practice of acknowledging the many people who helped make his work possible, the author would like to thank Andrée Bober, Mark Brooks, Bill Butler, John Hogan, Mariah Keller, Sofia LeWitt, Nisa Mason, Rus Mehta, Bruce Porter, Anthony Sansotta, Patrick Sheehey, Patricia Spencer, Kirsten Swenson, Andrew Witkin, and Jeremy Ziemann. Veronica Roberts is the curator of modern and contemporary art at the Blanton Museum at UT Austin. From 2010-2012, she served as Director of Research for the Sol LeWitt Wall Drawing Catalogue Raisonné and worked closely with the artist to coordinate his 2000 retrospective for the Whitney Museum of American Art. She has written extensively on LeWitt; most recently, in the summer of 2012, Master Drawings published her recent scholarly essay on LeWitt, “Like a musical score: Variability and Multiplicity in Sol LeWitt’s 1970s Wall Drawings.” She has lectured on modern and contemporary art at numerous institutions such as Dia:Beacon, MoMA, and the School of the Museum of Fine Arts Boston. Baume, Nicholas, ed. Sol LeWitt: Structures, 1965–2006. Exh. cat. New York: Public Art Fund; New Haven: Yale University Press, 2011. Brenson, Michael. Sol LeWitt: Concrete Block Structures. Edited by Susanna Singer. Milan: Alberico Cetti Serbelloni, 2002. Freidman, Martin. “LeWitt’s Concrete Proposals.” Exh. cat. New York: Madison Square Park, 2006. Garrels, Gary, ed. Sol LeWitt: A Retrospective. Exh. cat. San Francisco: San Francisco Museum of Modern Art; New Haven: Yale University Press, 2000. Haxthausen, Charles W., ed. Sol LeWitt: The Well-Tempered Grid. Exh. cat. Williamstown, MA: Williams College Museum of Art, 2012. Iles, Chrissie, ed. Sol LeWitt Structures, 1962–1993. Exh. cat. Oxford: Museum of Modern Art Oxford, 1993. LeWitt, Sol. “Ziggurats.” Arts Magazine 41, no. 1 (November 1966): 24–25. LeWitt, Sol. “The Cube.” Art in America (Summer 1966); reprinted in Adachiara Zevi, ed., Sol LeWitt: Critical Texts, edited by Adachiara Zevi. Rome: I Libri di AEIOU, 1995. LeWitt, Sol. “Paragraphs on Conceptual Art.” Artforum 5, no. 10 (June 1967): 79–83. Lippard, Lucy. “Sol LeWitt: Non-visual Structures.” Artforum 5, no. 8 (April 1967): 42–46. Roberts, Veronica. “‘Like a musical score’: Variability and Multiplicity in Sol LeWitt’s 1970s Wall Drawings.” Master Drawings 50, no. 2 (Summer 2012): 193–210. Roberts, Veronica. “Sol LeWitt.” In Encyclopedia of Sculpture, edited by Antonia Boström. New York: Fitzroy Dearborn, 2004. In 2011 Landmarks acquired Circle with Towers, one of LeWitt’s last concrete block structures. Located just east of Speedway outside the main entrance to the Gates Dell Complex, the work can be enjoyed not only as an abstract art form, but also as a social gathering place. Over a period of a few months in 2012, Landmarks worked with an expert from the LeWitt estate and a team of local masons to construct the piece, which had been exhibited in 2005 by the Madison Square Park Conservancy. Often artists will create many versions of the same idea. This is called variation. Using different shapes, lines, and colors, Sol LeWitt created hundreds of wall drawings similar to the one you see here. 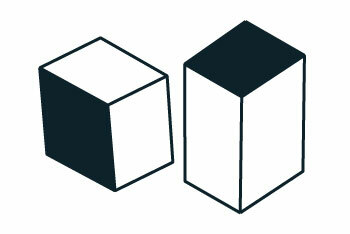 He also used repetition by depicting the same shapes, such as the cube, over and over again. How are the shapes similar? Look at how the artist has used the same shape (a cube) in a variety of ways, both in Wall Drawing #520 and Circle with Towers. Using colored paper, draw and cut out different shapes. Arrange the shapes in a variety of ways to create new images. See how many different arrangements you can make using the same shapes. Variation —Doing something over again, but changing it slightly. Repetition —Doing the same thing over and over again. Depict —To represent with a picture. Cube —A block with square sides. Sol LeWitt (1928–2007) wrote instructions for making works of art that other people can create. LeWitt once said, “The idea becomes the machine that makes the art.” He included shapes, lines, and color in his instructions, the same way in which composers use musical notes to express their ideas. LeWitt’s compositions continue to be created by teams of people who follow the instructions he wrote when he was alive. Wall Drawing #520 took a team of six people twenty days to execute. What geometric elements do you see in Wall Drawing #520 and Circle with Towers? How do you think he made each color in Wall Drawing #520? How is Sol LeWitt similar to a musical composer? How is he different than a musical composer? Make a shape by drawing two horizontal lines and two vertical lines, all the same length and connecting end to end. Repeat the first step two times to make three shapes. Color one shape red, one blue, and one yellow. Fill the background with green scribbles by overlapping blue and yellow scribbles. Compare your artwork to your partner’s. How are they similar? How are they different? Composition —An artistic arrangement of the parts of a work of art. Geometric —Simple shapes, such as lines, circles, squares, and triangles. Horizontal line —Points from side to side. Vertical line —Points up and down. Sol LeWitt (1928–2007) is recognized as one of the founders of conceptual art and minimalism. He valued the creation of a concept or idea for a work of art over its execution. In 1967 LeWitt famously said, “The idea becomes the machine that makes the art.” He often compared himself to classical music composers who draft their work for others to perform. Likewise, LeWitt’s artwork continues to be created by teams of people who follow his written instructions. LeWitt is most well known for his wall drawings and sculptures (known as “structures”). Simple geometric forms like the cube appeared in both his two-dimensional and three-dimensional works. Similar to the way in which composers use musical notes to express their ideas, LeWitt used basic visual forms as building blocks for creating a system of instructions for others to use in creating his works. Wall Drawing #520 took a team of six people twenty days to execute. LeWitt believed that it was important to recognize each artist who participates in the creation of his works, and their names are included with each piece. Must an artist use his or her own hands to create a work of art? Which is more important: the object or the idea? Why? How is Sol LeWitt similar to and different than an architect? Picture a simple image in your mind. It might contain color, basic shapes, and lines. Using writing materials, create a list of instructions that your partner can use to create the image. Write simple directions, such as “4 intersecting lines.” Trade with your partner and use each other’s instructions to create your partner’s image. How similar is the image your partner drew to the image you had in mind? Conceptual art —Art in which the idea or concept for a work is more important than its execution. Minimalism —An art movement that began in the 1960s. Minimalist artists create works that have no subject, but instead focus on the materials used. These artworks usually depict simplified, geometric forms. Geometric —Based on simple shapes, such as straight lines, circles, or squares.